"A Serialized Phantastick on The Ten Thousand Things &amp;amp;amp; The One True Only"
I nearly didn’t read this story the first time I came across it, because I read the first two scenes, and foresaw angst of an unpalatable nature. Then I came across it again through an ad, and kept reading. I am enjoying myself, a LOT. There is angst, but it’s working. 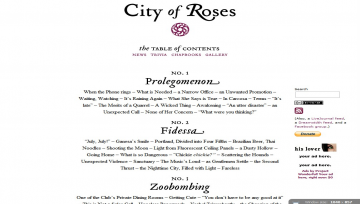 City of Roses has not been recommended yet.